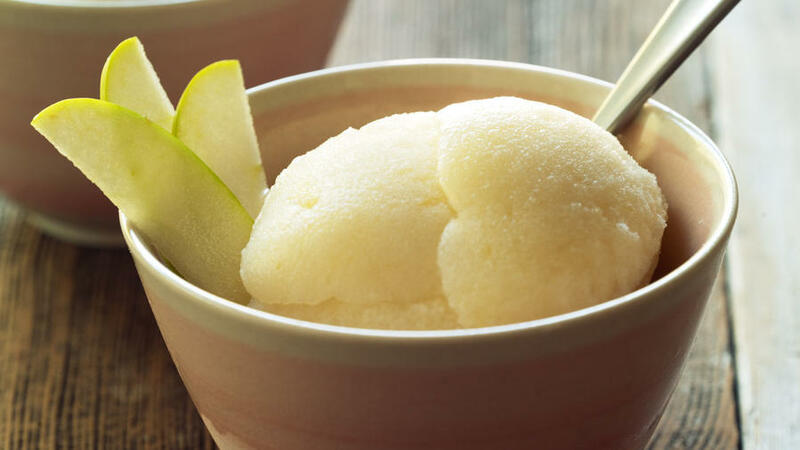 Sauvignon Blanc’s characteristic green-apple flavors blend seamlessly with the fruit in this sorbet. This dessert is from the upcoming book, The Apple Cookbook: 100 Sweet and Savory Recipes (W.W. Norton & Company, fall 2011). 1. Heat 1 cup water, the sugar, and apples in a medium saucepan over medium-high heat to a low boil, then reduce heat to low, partially cover pan, and gently simmer until apples are very tender, 10 to 15 minutes. Remove from heat and stir in wine, salt, and lemon juice. 2. Mash mixture through a fine-mesh strainer or a food mill into a bowl to remove skins. Whisk to blend evenly. 3. Pour purée into a shallow 9- by 13-in. baking dish and put in freezer 20 minutes. Freeze in an ice cream maker according to manufacturer’s directions. For a firmer texture, transfer to an airtight container and freeze another 8 hours before serving. Make ahead: Up to 1 week. Per 1/2-cup serving: 97 Cal., 0% from fat; 0.1 g protein; 0 g fat; 25 g carbo (0.3 g fiber); 70 mg sodium; 0 mg chol.